expensive database systems such as Oracle, IBM and Microsoft. MySQL AB has aggressively improved the feature set of MySQL with MySQL 5, making it more suitable for enterprise-level applications and uses. The MySQL certification tests, available at over 3,000 PearsonVUE testing centers, is a key component of this enterprise growth strategy, establishing a base level of skills for database users, administrators and programmers. The MySQL Core Certification is aimed at the database user who wants proof of his or her abilities in such fundamental areas as SQL, data entry and maintenance, and data extraction. The MySQL Professional Certification test is designed for the advanced user who wants to prove his or her knowledge in such areas as database management, installation, security, disaster prevention and optimization. Both tests are thoroughly covered in the "MySQL Certification Study Guide." 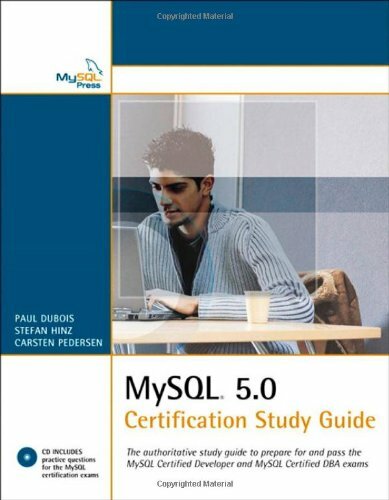 Written by Paul DuBois, the leading author of books on MySQL topics, and reviewed for technical accuracy byMySQL AB, this book is the fastest, most reliable way for MySQL users, developers, and administrators to prepare for either of the MySQL tests.